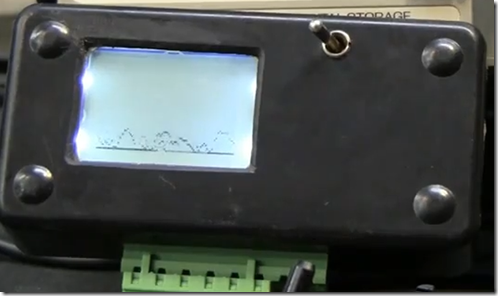 I’ve seen videos on YouTube using an Arduino and a Graphical LCD screen (GLCD) to create a simple Oscilloscope. The annoying thing is that I found no help whatsoever on how to build one. I spent a few days figuring out how to use the Nokia 3310 LCD screen and then figuring out how to sample an analog port to create a fun oscilloscope effect. I don’t claim that this device can replace actual test equipment but it might be useful and for $40.00 bucks in total parts it is a blast to play with. The setup is really simple, connect an Arduino Pro Mini to a Nokia 3310 LCD screen, sample an analog port and then wright the pixels to the screen. I even added two potentiometers, one that adds delay to the sample to essentially provide a basic time scale and another pot that can scale down voltages as long as they are below three volts (the operating voltage of the micro controller). Unfortunately if you want to sample sign waves that have voltages over three volts you are out of luck unless you build an electronic circuit to scale it down somehow. Another unfortunate feature is that the analog input only shows positive voltage so the scope is really a positive DC or AC scope only. Here again custom electronics could be built but there is something beautiful about keeping it simple. I don’t have a professional function generator so I could only test its range from 100 ms to about 1 ms scales. Created by:  Fileark. see Fileark.com for more info. Note:        Please reuse, repurpose, and redistribute this code. well, i’m no pro too, newbie tinkerer. i just recently got into sound stuff with arduino and the timer interrupts play an important role there. beware: cryptic assembler stuff in the example codes! if i get a display and find some time, i’ll give it a try. thanks for posting code and schematics! have you thought about or tried grabbing the signal sample in the atmegas isr loop? should give you faster and thus more acurate sampling! Thanks Peek, I have no idea what you are talking about so no, I have not thought of that lol. I look forward to anyone that takes interest and refines or comes up with a better method! (I am not a pro just someone learning) I have other hardware lying around that I wanted to try too for the learning experience, Netduino, Stellaris LM3S811, hopefully I get the time to do that.